The home improvement retail segment is witnessing an uptrend courtesy of higher home prices, which is discouraging the purchase of new homes. Meanwhile, this is acting as a catalyst to home improvement retailers as households choose to overhaul and remodel their existing homes. Per analysts, U.S. home prices are expected to jump twice the speed of inflation and wages in 2018, which might prove beneficial to home improvement retailers. Notably, home improvement retailers like The Home Depot, Inc. HD and Lowe's Companies, Inc. LOW are flying high reaching a fresh 52-week high on Sep 12. The upside can be primarily attributed to their robust growth initiatives, including omni-channel growth and focus on Pro customers. Higher demand for product categories such as lawn, garden, seasonal, outdoor living and cooling products is also driving growth. Rising demand for lumber and other building materials on gradual recovery of housing market is too adding an impetus to the company. Impressively, Home Depot and Lowe's have outperformed the broader market in a year’s time. 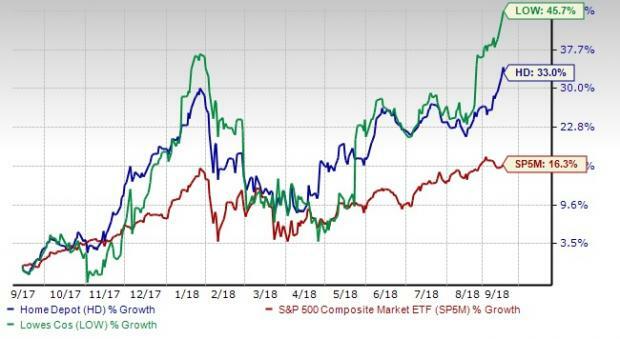 Shares of Home Depot and Lowe's have surged 33% and 45.7%, respectively, cruising ahead of the S&P 500 index’s 16.3% rally. Let’s explore the stocks individually. Shares of Home Depot scaled a 52-week high of $215.43, closing the session lower at $211.98. The company has been gaining from consistent focus on affording innovative products, boosting interconnected customer experience and driving productivity. Additionally, its integrated retail strategy that connects offline and online channels has been well received by customers. Home Depot is also witnessing improved customer satisfaction scores and conversion rates through investments in interconnected capabilities, which encompass both digital properties and physical store assets. Home Depot’s Pro segment continues to gain traction on improving portfolio service offerings for Pro customers through the enhancement of maintenance, repair and operations (MRO) products. Notably, sales to Pro customers improved double-digits in the second quarter of fiscal 2018 with Pro heavy categories like lumber, in-stock kitchens, power tools, windows, and concrete all recording double digit comparable-store sales (comps). Home Depot’s shareholder-friendly moves are impressive as well. The company repurchased 9.3 million shares for $2 billion in the second quarter and targets buying back shares worth $6 billion in fiscal 2018. Meanwhile, the company’s long-term financial targets, which are likely to be achieved in fiscal 2020, are boding well. This Atlanta, GA-based company has been reporting strong financial figures since 2008, with steady improvement in revenues and earnings per share. Incidentally, the company retained its five-year-long trend of beating earnings estimates in the fiscal second quarter. Moreover, it delivered positive sales surprise in seven of the trailing eight quarters. Shares of Lowe's also touched a 52-week high of $114.54, though it closed a notch lower at $114.34. The company has been witnessing sturdy growth in comps driven by well-chalked initiatives to boost sales across stores and online. Comps rose 5.2% in second-quarter fiscal 2018 on increased traffic and growth in transactions as well as rise in average ticket. Moreover, attractive offers and effective marketing strategies have been driving comps. Strong digital presence has also been a fueling factor. During the fiscal second quarter, the company registered 18% comps growth on Lowes.com. Going ahead, management continues to augment omni-channel capabilities and enhance consumers’ digital shopping experience. Further, the company plans on optimizing search capabilities that will aid in planning assortments effectively. Furthermore, Pro customers remain a key catalyst behind Lowe's business growth. The company has been strengthening pro-focused brands to augment pro customers’ sales. It has also refurbished the pro-service business website, LowesForPros.com, in order to give special attention toward the needs of its Pro-customers. Lowe’s consistent focus on shareholder-friendly moves is an added positive. In the fiscal second quarter, the company repurchased shares worth $1.1 billion and distributed $338 million as dividends. It plans to carry out share repurchases of approximately $3 billion in fiscal 2018. We expect these stocks to continue soaring high and create new records, given their solid strategic actions, recovery in the housing market and impressive long-term earnings growth rates. Currently, Home Depot boasts an expected long-term earnings growth rate of 13.3%, while that of Lowe’s is 14.4%. Both these stocks exhibit a Growth Score of A, which clearly demonstrates further growth potential. Other stocks worth a look in the same industry are Tecnoglass Inc. TGLS and Fastenal Company FAST. Shares of these companies advanced 36.4% and 34.9%, respectively, in a year. While Tecnoglass sports Zacks Rank #1 (Strong Buy), Home Depot, Lowe’s and Fastenal carry a Zacks Rank #3 (Hold). You can see the complete list of today’s Zacks #1 Rank stocks here.